Beaches, blue waters and dazzling sun. Summer is here – let’s celebrate with some fabulous summer-themed slots! There’s a lot of summery slot games that are guaranteed to put you in the right mood for summer. And who knows, you might spin your way to some extra holiday spending money. We’re taking a closer look at some of them. Check out the best online casinos to start having your summer fun. Summer is the lively, fun and adventurous season that everyone loves. Birds chirp and fly in impressive patterns under the blue sky, the salty scent of the ocean tickles us and we can’t avoid the pool. The bliss of summer comes and goes but the thrill of summer online slots remains, for you to enjoy even after summer is gone and winter comes. 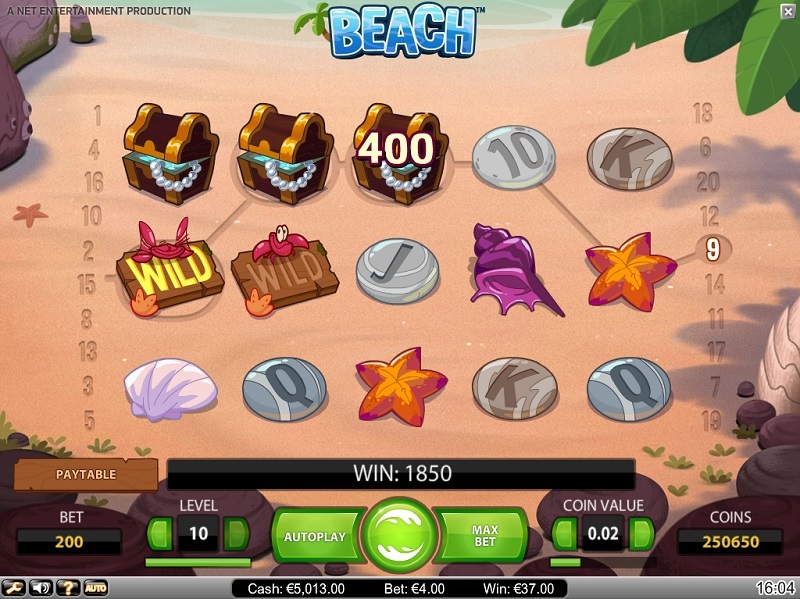 Let NetEnt’s Beach Video slot thrill you into the summery mood. With the blue sea, the white sands and seashells to play with. Get more wins every time you open the pirates’ treasure chest. When the ocean waves come in, the slot starts to spin and symbols appear. If you land the octopus which is also the wild symbol, you earn a 2x multiplier. This game is perfect whether you are by the ocean, under a palm tree or basking on your poolside. Transit yourself to sunny beaches and parties by the sea shore whenever you play this game. Bikini Beach from Gaming Interactive is the ideal way of spending your summer. This 5-reel and 30 Payline games comes not only with good-looking bikini babes and cocktails but also special features. Lap in the waves, soak in the sun, select your beachwear and top your sunscreen, to earn bonus games, free spins and other prizes. Sunny Shores from Yggdrasil Gaming is a 5-reel and 27-payline slot. Designed as a tropical paradise, the game stands out with its sun-bathed background and Teletubby-like vibe. Land 16 Sunny Wild symbols and trigger the Expanding Sunny Wild feature, followed by re-spins.